I want to show you something that I have been using on a regular basis lately. And I am in love with it! So is LC by the way. Some of you may know already, but we have a 9 lb. dog who pees on every carpet she can come into contact with. It is super annoying, and it ruins our carpet. I try to catch it and clean it up immediately, but after a little bit, our carpet starts to stink. I shampoo it a couple of times a year, but that is the best I can do. So I was constantly buying carpet powder, which really helps the odor. But one day, through the magic of pinterest, I happened on how to make your own for a fraction of the cost! Fireworks! Below is an image of the pin with a link back to the original source, the Happy Homemaker. Well, happy homemaker, your recipe made me very happy! It is so simple! Just mix baking soda with several drops of any essential oil you want to with a whisk and put it in something you can sprinkle it on the carpet with. Now, on the pin, people made some comments that I also utilized. One was to also mix in 1 cup of Borax, this will kill any fleas or bugs that might be lurking around. The other was to mix in some ground clove or nutmeg instead of the essential oil and that it will smell really good. 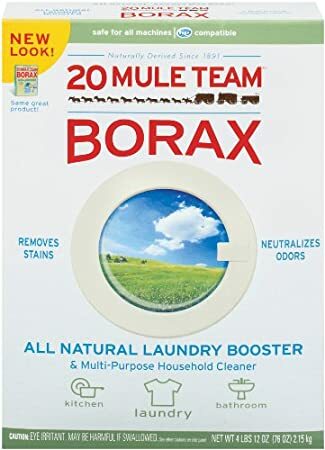 I have actually used Borax in the past when I was battling a flea problem with my dog. My BFF has dogs and she says she uses it on a regular basis on her carpet. I tried it, and it worked like a charm! No more fleas! 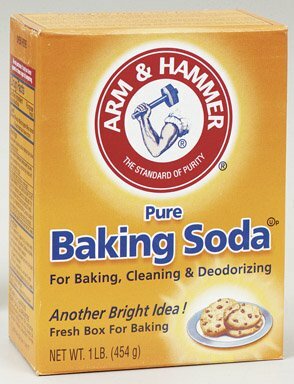 So off to the store I sent LC to get some essential oil, Borax, and Baking soda, the biggest boxes he could find. The first time I made some I used the essential oil, and it smelled really good. I think ours was lavender. But it made the powder just a bit too clumpy. So when it ran out, I used nutmeg for the next batch. And it was perfect! We usually sprinkle this on the carpet before we leave to go somewhere, put the dog in her crate,and when we get home we vacuum it up. You would not believe what a difference this stuff makes in our home! It is the best thing since sliced bread! It smells so fresh and clean! I have made 2 batches so far, and I still have plenty Borax and Baking soda for a few more batches! What I did was to save a container of the Glade carpet powder when it was empty, and that is what I use. I just keep refilling it. Below are some pictures of what you will need. But keep in mind the Glade is pictured just because I am using the empty container over and over again. Hi, I like the idea of the homemade carpet cleaner but, I have also heard that powdered carpet cleaners can eventually ruin your vaccum. Haveyou ever heard anything about that?? I would like to use carpet freshener but am afraid to do it alot. I have never heard that, and you are making me paranoid, because we use it all the time! So far, no vacuum cleaner problems. We have a Kenmoore canister vacuum cleaner and it has bags. I cna't think of any reason why it would hurt it, but I will have to google that for sure! Sorry didn't mean to make you paranoid haha 🙂 Maybe it's just the ones that don't have bags, I don't know but if you goggle and find out anything let me know. Not bad at all to have this homemade freshener. Thanks you, I really love it! So far, my favorite I have tried is the nutmeg. It smells fresh and clean. I nee to make more because I used all of mine yesterday, I might try ground clove this time and see what I think!